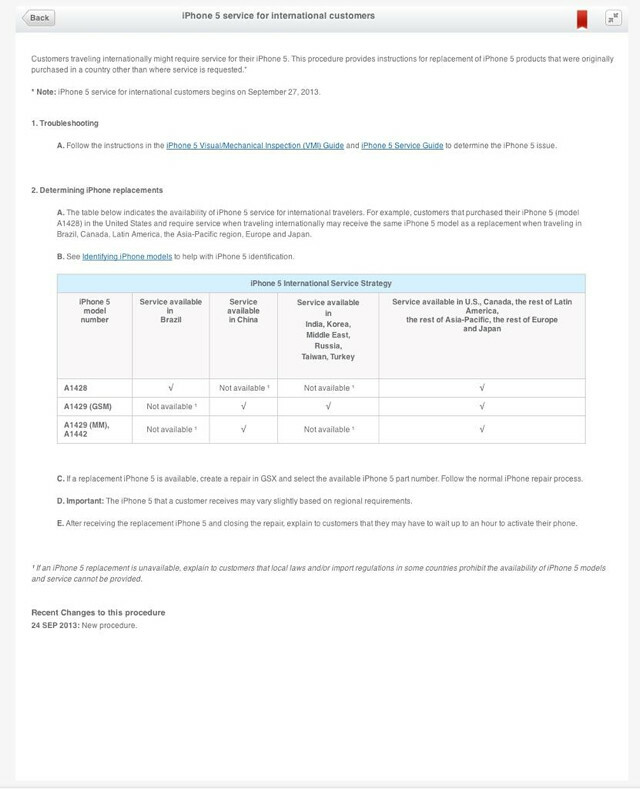 AppleCare will cover iPhone 5 owners traveling internationally starting September 27th, according to internal documents leaked by Sonny Dickson. AppleCare is pleased to announce the enhanced availability of international service for iPhone 5 customers beginning September 27, 2013. If customers traveling internationally require service for their iPhone 5, follow the instructions in the Service procedure iPhone 5 service for internal customers to replace their original iPhone 5 with the same model. Note: AppleCare is enhancing international service for iPhone 5 customers in most countries. However, local laws and/or import regulations in some countries may prohibit the availability of some iPhone 5 models. AppleCare+ costs $99 and gives you two years of coverage on your device. Take a look at the screenshots below for more details.